Here are the photos of the inside of the box I posted a couple days ago. 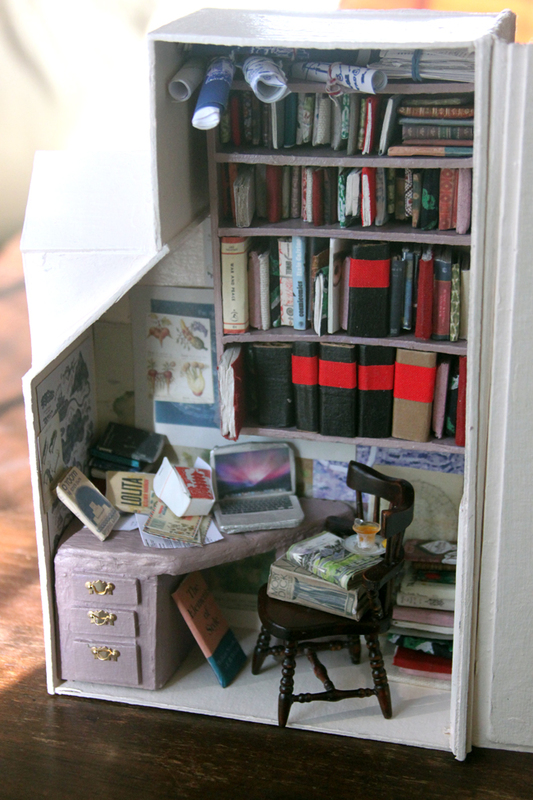 It's a miniature library and writing room I made for my sister, who is a writer and studying to become a librarian. 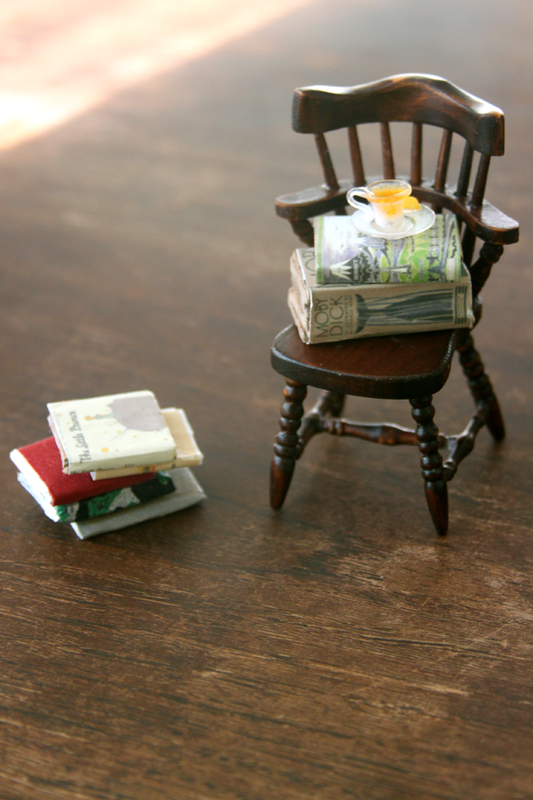 All of the miniature books are handmade by me. Some have individual pages, made of glued Mohawk paper. Others are stacks of book-board or cardboard cut to size. All are individually covered with paper or bookcloth. Because mostly only the spines are showing, I looked for photos of book covers that included the back covers and spines. Some even have the flaps for the inside covers! Also I found an amazing trove of beautiful vintage book jackets at Facsimile Dust Jackets. I tried to find covers for books my sister owns, but it was difficult to find images of the full jackets with spines. The posters, laptop, and takeout box were printed from images on my computer and then assembled for the interior. The door, windows, chair, teacup, and hardware (drawer pulls and doorknob) are store-bought miniatures. The box is about 2" deep. It has about the dimensions of a large paperback book, so it can fit on a bookshelf. 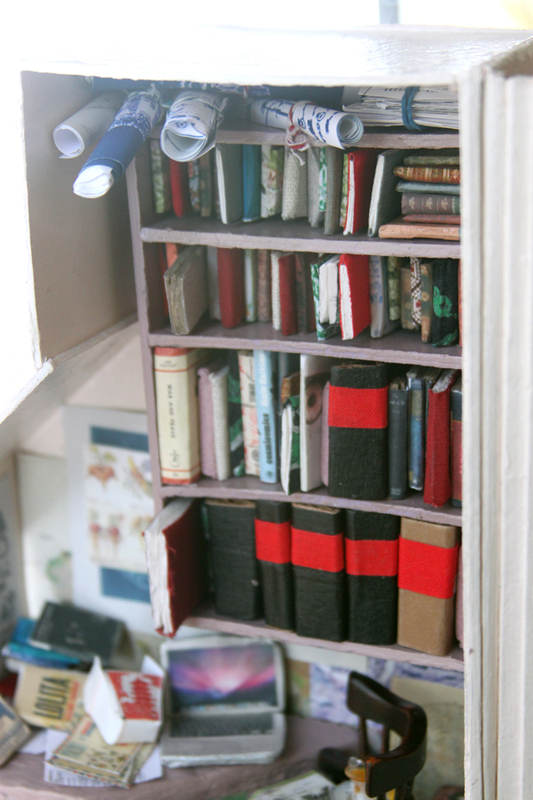 The outside, including the cornice, are made from book-board, with a quarter-bound spine covered in bookcloth. The rest of the box is painted using semi-gloss housepaint for a dollhouse feel. I am still new at making boxes, so you might notice a few corners that are not square and the like. But I'm very happy with the feel of this little writing room. It's beautiful. You're sister must be as special to you as mine was to me.